Participation is rather a dirty word among architects. After all, it surely leads only to DIY architecture. In the development of a vision for the Kanunnik Petrus Jozef Triest Square, an open and accessible space, directed by the BAVO for the Caritas psychiatric centre in Melle (near Ghent), and its design by architecten De Vylder Vinck Taillieu (aDVVT), we see that things can turn out differently. The recent Architecture Book puts good-quality architecture on a par with tailor-made work and this immediately shows up its inadequacies. Tailor-made architecture is an obvious choice for building a private house. For public assignments things are more complicated, because it is rarely with the ultimate user that the architect comes into contact. In this case, the social interaction concerning the design assumes a representative nature and is given a technical interpretation. In the care sector, it is customary to compensate for a rather technocratic administration by involving patients (and/or ex-patients) in the decision-making. They play a part as experts by experience. This method is not as transparent as it seems. The patient supplies potentially important experience-based information, but it is the architect who, following further consultation with the administrators, processes this and other data to reach a design. In this way, good intentions endorse a structurally uneven relationship. Like this, the patient is reduced to the role of a consumer of the building. This ex-patient’s complaint is not only about his experience of the space, but is a fundamental critique of care architecture. All the talk of a healing environment turns out to be newspeak for a bleak hospital rationality. The question is whether any radically different approach is possible in the complex reality of psychiatric care. Is the patient also allowed to make an appearance as the producer of a recovery-oriented environment? In the development of a vision of the psychiatric centre of the future that took place at the Caritas clinic in Melle, we, the BAVO team, brought all the users together at the drawing board (inspired by Doina Petrescu’s ideas on the user-architect). Workgroups of doctors, managers, staff and patients examined the question of what was to be done with the sea of green open space left after the demolition of the 19th-century buildings? The Ghislaine, Sint-Jozef, Wasserij and Lente buildings were to make way for a new building for the crisis unit and children’s campus. The workgroups were given the task of drawing up master-plans involving the programme of new building. The element of participation led to a completely different result from what had initially been proposed. The removal of asbestos from the Sint-Jozef building delayed its demolition, with the result that people fantasised a lot about the new future of this inheritance from the past. In the workgroups, Sint-Jozef started to become a catalyst in a process of giving tangible form, in a single building, to the needs and wishes that came up in the overall organisation of the care campus. The options suddenly seemed infinite. For instance, the empty building might be used as the large activity area that the management dreamed of, and at the same time as the sorely needed in-between space where patients can shelter, rest, dream, meet each other and many other things. Sint-Jozef might also act as a wishing wall. The administrators listened to these new insights and halted the demolition. After all, the proposal from the workgroups was appropriate to a general change of policy. Policy logic still takes the bed as the basic unit of calculation in mental health care, and this leads to the typical hospital architecture. But in psychiatry this unit has little meaning, because patients are not always bedridden. In addition, since the implementation of what is called ‘Article 107’, there is an increasing focus on care networks that cover both residential care and ambulant care and mobile teams. In this sort of context, the workgroups came up with a completely different architectural concept for mental health care: the future of a psychiatric centre does not lie only in better houses filled with beds. 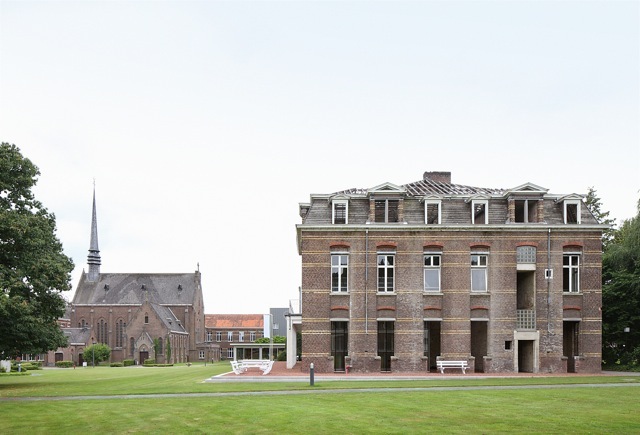 In the new project definition, Sint-Jozef was converted into a monumental outdoor space at the heart of the care campus. The building has no specific function as part of the hospital – it is neither therapeutic nor residential – but is an open structure that anyone can use for activities that are not pre-defined. In this way, a different sort of participation becomes apparent at Caritas: the patient is not simply a user-architect (to use Doina Petrescu’s terminology) but in the first place acts as an originator of the request for care. Patients also played an active part in the subsequent design process. 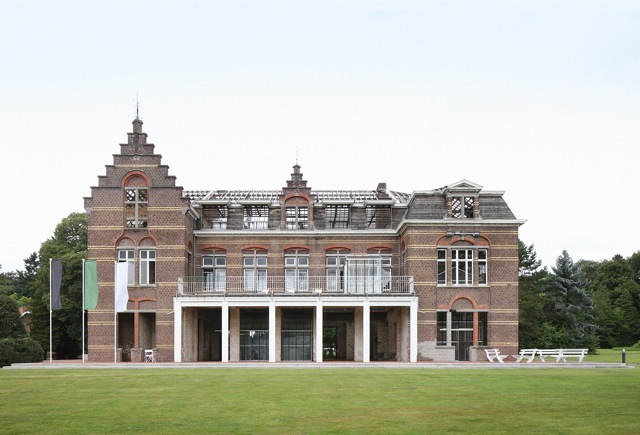 Part of the architectural brief that BAVO formulated was the request to develop a method by which the dynamic engendered in the workgroups was incorporated into the design. 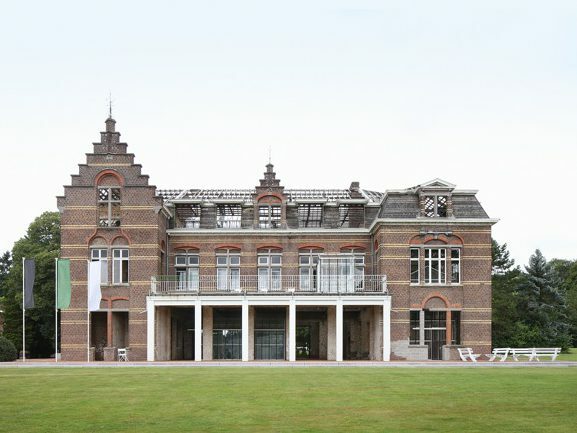 Architects De Vylder Vinck Taillieu (aDVVT) proposed opening up the building in its then state of partial demolition. The ground floor was cleared of obstacles and then fitted out. This meant that the design deviated from the project definition, which, based on a well-advanced level of demolition, had in mind the sort of ruin that forms part of an English landscape garden. The architect’s idea was to avoid any options that would irreparably harm the future of the building. This meant that the demolition of the Sint-Jozef building was definitively cancelled. A scale model was used as a means of negotiation and enabled all those involved to exchange needs and desires. Parts of the model could be removed or added, which made the impact of each decision immediately visible. This stimulated the imagination. Consultation on the work took place in the empty building itself – into which rain fell unimpeded – again with doctors, management, staff and patients. In this way the users once again had their say before work started. The participation process enriched the design proposal with new ideas. 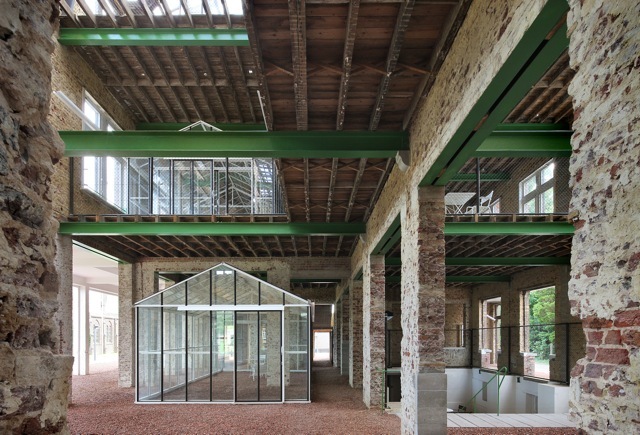 Discussions arose on the use of the greenhouses inside the building. In the end, they were left purposely with no specific use, so that users can use them in accordance with their acute needs. The participants in the discussions also put forward proposals regarding the design of the cellar, which had been opened up. Patients preferred not to see any barriers anywhere in the building, but only stylish ways of marking areas off. The ad hoc linkage of the cellar to the ground floor by means of sloping seating was also the result of deliberation on a rainy winter’s day. The participation did not detract from the work of the architects. In addition to enriching the design, it also provided a strong basis for the retention of particular design ideas that were in danger of being dropped for pragmatic reasons. 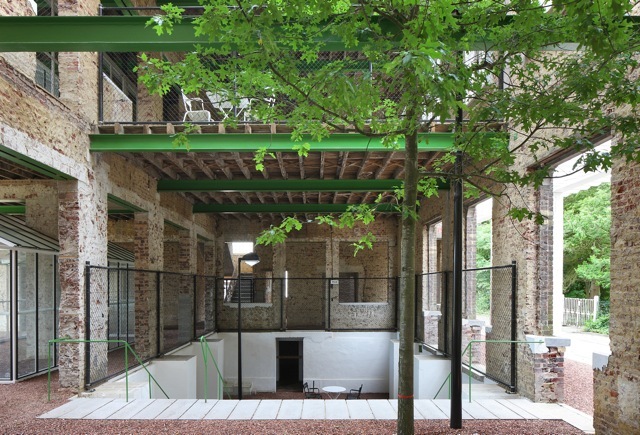 For instance, the open interior of the building and the mirroring of the existing loggia were retained after deliberation in the workgroups. In this way, participation enhanced the creative role of the architect. The result is a collective design process where the role of author cannot be attributed to any particular member. In the architectural production process for the Kanunnik Petrus Jozef Triestplein, we see the outlines of a form of relational architecture analogous to the reasoning developed by Nicolas Bourriaud for art in his Relational Aesthetics. The aim of the design by aDVVT is that the building, once it has been redesigned as an open structure, should function as a 1:1 scale model that can be adapted at any time to the changing needs and desires of its users. So the same aesthetic emancipation is possible not only in the brief and the design, but also in its use. One good omen is that a patient in one of the workgroups spoke the shy but proud words ‘Jozef belongs to us’ – as a response to the technical discussion of who is given access to the building and when, and who takes responsibility. What this patient said shows an identification that goes much further than appropriation. A new relationship between doctors, management, staff and patients was formed in the course of the creation of the Kanunnik Petrus Jozef Triestplein. The patients were not appealed to for their spatial experience of being ill (the design process is not a therapeutic process), but were drawn into a professional discussion of the design of the therapeutic setting.